This rug is one of the nicest I've had the privilege to own in that the colors are very desirable: browns, blacks, grays, pale mustards and a little bit of pale blues here and there. Measuring 26 inches high by 39 inches wide, it is made of wool/gabardine strips hooked on burlap. It is very reminiscent of that iconic Frost pattern cat we are all so familiar with found lazing on a rug, but it is there that the resemblance to the Frost pattern ceases. The border is bold and almost abstract, instead of leaf and vine or flower-strewn. 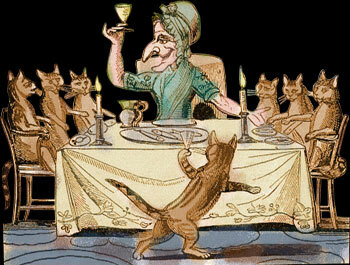 At first the gray masses fool the eyes (from a distance) into thinking they are lots of mice dancing around old Tabby. But upon closer investigation, you see that they are purely decorative little gray puffs, almost cloudlike in appearance. Tabby, herself, is wonderfully executed in both color and style. The rug she sits on, quite wonderful as well. If this, indeed, did start life as a Frost pattern, the artist who did this decided to execute her own hand and did a remarkable job. It is professionally mounted by Ken and Kathy Wilson, and is in excellent condition with no rips, holes or repairs. 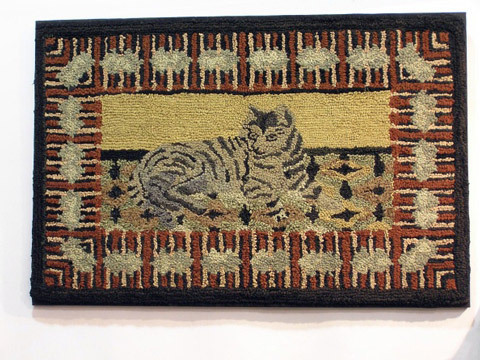 A superb piece of folk art, this rug adds stunning presence to wherever it is displayed.